In August of 1857 some 477 passengers left the Vallejo Street Wharf in San Francisco headed from the California Gold Rush back to the east coast. Their journye began first by steamship to Panama, then over the isthmus by railroad– and finally aboard the S.S. Central America steamship headed for New York. Little did these adventurers on board the "Ship of Gold" realize they were headed toward a watery grave in the Atlantic Ocean. On that tragic day in September of 1857, the mail steamship S.S. Central America was battered by a fierce hurricane off the coast of the Carolinas. Within a few hours, over 420 passengers and crew members plus the ship full of gold treasure sank to a watery grave where they remained buried beneath the Atlantic Ocean for the next 150 years. Click here to order the Free Shipwreck Collection. Thanks to the recent advent of underwater robots, items from famous shipwrecks like the Titanic and the S.S. Central America have been brought to the surface and saved. The newest deep sea recovery technology was used to bring up and preserve these historic, National Treasures. At this time only, Austin Rare Coins is proud to offer to the American public a rare opportunity to acquire one of these important pieces of California Gold Rush history. Without a doubt, the gold aboard the S.S. Central America shipwreck of 1857 is one of our country's most important gold hoards. It's been called “America’s Lost Treasure” and is often compared to the Crown Jewels of England or King Tut’s Tomb. Indeed, among the contents of this gold treasure ship are priceless pieces of American history and items of inestimable value– worth far more than ordinary collections of precious metals or rare coins. This amazing shipwreck had on board tons of California gold bars– and a treasure chest filled with $20 Liberty gold coins, dated 1857. These coins were newly minted from the San Francisco Mint and were preserved underwater in gem, mint condition. Since these 1857 gold coins were salvaged from the ocean floor, each one has been certified authentic and graded by PCGS. Each coin was placed in a specially sealed holder along with it's unique Pedigree designation "S.S. Central America" to forever guarantee the originality of these rare, National Treasures. For price and availability, call a Rare Coin Advisor at 1-800-928-6468. The National Treasures from the 1857 S.S. Central America Shipwreck, better known as The Ship of Gold, are a snapshot of America’s most historic era, the California Gold Rush. Salvaged from the shipwreck was gold in the form of raw gold dust and even small nuggets. There were also gold assay bars weighing up to fifty-five pounds. For rare coin collectors there are some of the most highly prized gold coins form the Pre-Civil War, frontier days including mint condition $20 Liberty gold pieces struck in 1857 at the United States branch mint in San Francisco. Several books have been written about this historic Ship of Gold– the S.S. Central America that sunk to the bottom of the Atlantic Ocean in 1857. The most famous book is "America's Lost Treasure," a complete pictorial chronicle of the sinking and recovery of the United States Mail Steamship Central America. Our thanks to the authors for sharing these photos with us. This amazing steamship, truly a treasure ship, not only carried 422 passengers, but 38,000 pieces of mail, and literally tons of gold ingots, gold nuggets and gold dust from the California Gold Rush of the 1850’s. The gold coins on this treasure ship are priceless pieces of American history. Many items are of inestimable future value– worth far more than ordinary collections of precious metals or rare coins. Many artifacts from luggage, clothing, bottles, and china dishes were recovered from the ocean floor after 150 years and moved to museums for safekeeping. As a major rare coin dealer, we're thrilled with the $20 Liberty Gold coins dating 1857 which were on board. From an historic point of view, the Central America shipwreck is a unique time capsule. It reflects the prosperity of the California Gold Rush and symbolizes the very character and spirit of the Western frontier before the Civil War. What is remarkable is the condition of the coins recovered in the 1857 shipwreck of the S.S. Central America. We'll show you how these historic gold coins were salvaged and share details on how these shipwrecked coins were preserved in pristine condition after 150 years under the ocean. Scientists believe that special environmental conditions combined to preserve the treasures from the S.S. Central America shipwreck. The frigid temperatures and a nonexistent current at 8,500 feet below the ocean preserved the finest details of writing on the gold bars and gold coins. Almost miraculously, the soft surfaces of the gold coins were not etched by the salt water. 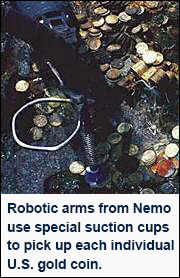 The photo on this page shows the gold coins on the ocean floor scattered around where they fell. Amazingly, columns of gold coins were still stacked even though the wooden boxes that had once surrounded them had rotted away decades ago. Bringing these coins to the surface was quite a task. Thanks to the meticulous efforts and special suction devices, many of the gold coins were brought to the surface one by one in a nearly perfect state of preservation. To retrieve the large blocks of coins, sophisticated salvage equipment was invented to pour silicone rubber in liquid form around the stacks of gold. Once the silicone dried, the robot could safely pick up the block intact and carry to the surface. Our Austin Buying Trust has carefully inspected these 1857 coins and we were amazed at the state of preservation and magnificent eye appeal. Each coin has passed the rigorous inspection of the Professional Coin Grading Service and we have available specimens grading in Gem Brilliant Uncirculated, Mint condition MS-64 and MS-65. All coins are certified and fully guaranteed. Each $20 Liberty in this release has been encapsulated in a registered and numbered holder. Sealed inside is its grading certificate along with its official Pedigree “S.S. Central America" which forever documents this as an official coin from the 1857 shipwreck. Also included is special deluxe leather packaging perfect for gift giving. For more than a century, the legends and mystery of the “Ship of Gold” lured would-be salvagers to the Carolina Coast. Books were written documenting the disaster. 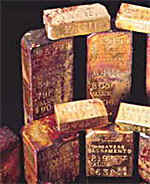 Tales abounded of gold bars weighing up to 750 ounces. Ultimately the lure of the S.S. Central America attracted the attention of the world’s best ocean engineers and scientists. Still, it seemed impossible that the lost treasure ship could ever be found and recovered from the deep waters of the Atlantic Ocean. In 1988, ocean engineer Tommy Thompson, geologist Bob Evans, and the Columbus Discovery Group went in search of the treasure ship S.S. Central America. Dr. Lawrence Stone, a leading expert on search theory, was brought in for the search. He had gathered data from the 1968 search in the Atlantic of the U.S. nuclear submarine Scorpion. With the aid of sophisticated computers, the scientists built sophisticated search models similar to those you've seen used in recent airplane crashes in the Atlantic. An enterprise of 161 partners raised $10 million dollars over three years to fund the team of 40 scientists, engineers and technicians in the search. The advent of side-scanning sonar helped to map the ocean floor in detail. After two years of searching, a ghostly image of the side-wheel of a steamship and a ship's bell appeared on the monitors. Without a doubt, this was the S.S. Central America! In a strange coincidence, it was the same day September 11th some 131 years earlier that the S.S. Central America began taking on water during the hurricane. In many ways, locating the S.S. Central America was a more important event for Americans than locating the Titanic. After all, this was U.S. mail steamship, filled with historical artifacts and Pre-Civil War gold. Then, unexpectedly the first gold ingots came to light. Amidst rotted wood, scattered gold dust, gold bars, and gold coins began to appear. And now, after a years of legal battles, the Supreme Court has ruled and the coins are now available to American public. If you'd like to speak to a Gold Advisor about these coins, call Austin Rare Coins at 1-800-928-6468.